Edwardian Taylor is one talented guy! 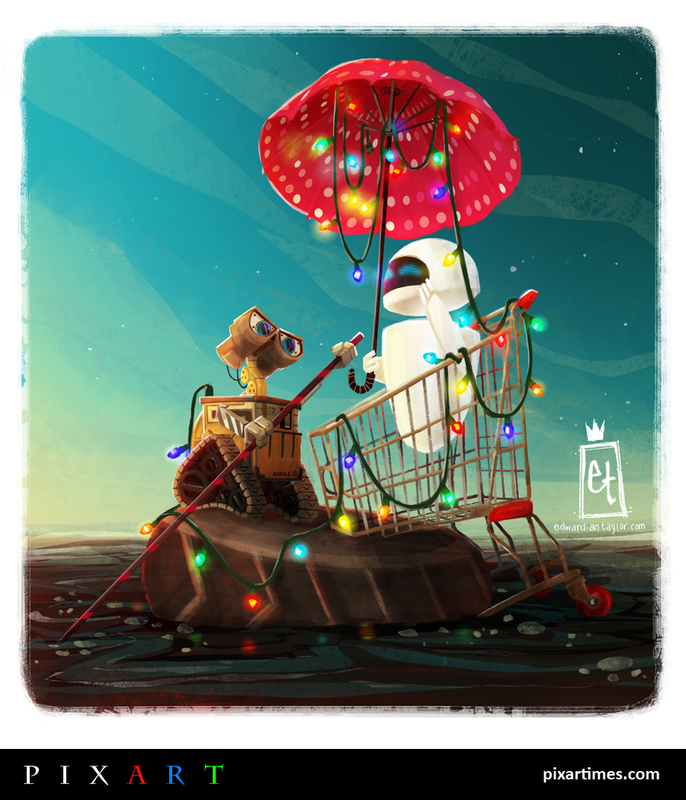 One look at this fantastic tribute to Wall-E and Eve and it’s obvious where his passions lie. Coming from a background in both traditional illustration as well as animation (both 2D and 3D), he’s a bit of a jack of all trades. Take a look through his extensive portfolio to see the many sides of this versatile artist. We’re so thankful he took the time to contribute to PixArt. We hope you like his piece as much as we do. Take a closer look at it after the break! I currently live in . . .
Little Elm, Texas. It’s about an hour drive outside of Dallas, if I’m speeding. I consider my hometown to be . . .
Where I was born, the “Aloha State” of Honolulu Hawaii. I can teach you how to not hula. My favorite Pixar movie is . . . The Incredibles! Who wouldn’t like a movie about superheroes?!? It did make me realize how unpractical capes were. What I enjoyed about this movie was its graphic quality, setting it apart from many other 3D animated films at the time. I’m also a huge The Iron Giant fan. It is coincidental that Brad Bird was the director for both films. He’s one of my favorite directors I would love to work for. My favorite Pixar character is . . .
Wall-E. I’ve always felt that he embodied humanity’s spirit more than any of the other characters in the Pixar realm. Wall-E’s endearing personality made me forget that he’s supposed to be a machine. Poor fella just wanted someone to love. Who can’t relate to that? My favorite scene from Wall-E was the montage after Eve went into hibernation mode and Wall-E kept her company. The shot of him pushing her gondola style through the oil was one of my favorite parts. I decided to base my illustration on that moment. I’m a late bloomer … in most things (like hula); the animation art field is no exception. Since I only started honing my skills in my late 20’s, I feel there is so much I want to do and accomplish. There is this urgency to my work. I do not, however, sacrifice my critical eye or attention to detail. My strength is my ability to edit. What fuels my passion is celebrating what my peers’ produce through social media and the projects like movies, books, or games in which they are involved. Every artist is unique in their individual success. Watching others’ success (and failure) has been inspirational and motivational in my own experimentation and personal growth and improvement. Draw, draw, and draw some more. It’s really the only thing that will make you a stronger artist. There is no magical class, book, or online resource that will unlock “Art Nirvana.” The only truth you can find is discovering yourself and art through constant exploration. My friends, family, and coworkers know I draw all the time. I always keep a sketchbook (or three) near me to sketch out ideas that one may normally forget. Keeping a sketchbook by your bed is also something I do. If I could draw in the shower I would. I have to remind myself that there are no bad sketches, only ones you have not explored enough. At the moment I’ve been salivating over art of books like Big Hero 6, The Book of Life and The Boxtrolls. I just love how unique each of these studios are pushing the look of current 3D animation. Art of Books is also something of an investment to see what the new standards are for elevating your art. So it’s good to keep materials like these handy for inspiration. You can follow me on Instagram, Twitter , and Tumblr. I also have my regular blog where I have links to my portfolio and resume (which I’m in the process of updating). So please follow me! I currently work for Element X, a commercial studio in Dallas. So my goal for this next year is to be able to do some freelancing on an animated feature film or TV show, work on a video game, make a children’s book, and participate in a few group art shows.